"I'm a huge Bengals fan. My birthday, my daughter's birthday and my wedding anniversary are all in October. My husband and I would love to finally get to celebrate our 7th Anniversary this year and this would be a wonderful gift. He works full time and I'm a stay at home wife and mother of 4. Everything we do, eat, sleep and breath is for our children. This would finally be an opportunity for us to enjoy each other and time away from the children that we need so dearly. I'd love to win so I can show how much I appreciate my husband." 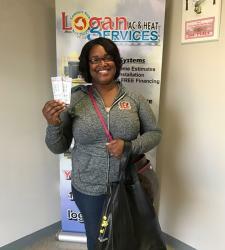 We are so excited to send Brandy and her husband to the big 'Battle Of Ohio' game this weekend! It's sure to be a game worth watching, no matter which team you are rooting for! Do you want to be our next winner? Check out our Giveaway page to see what's going on now!